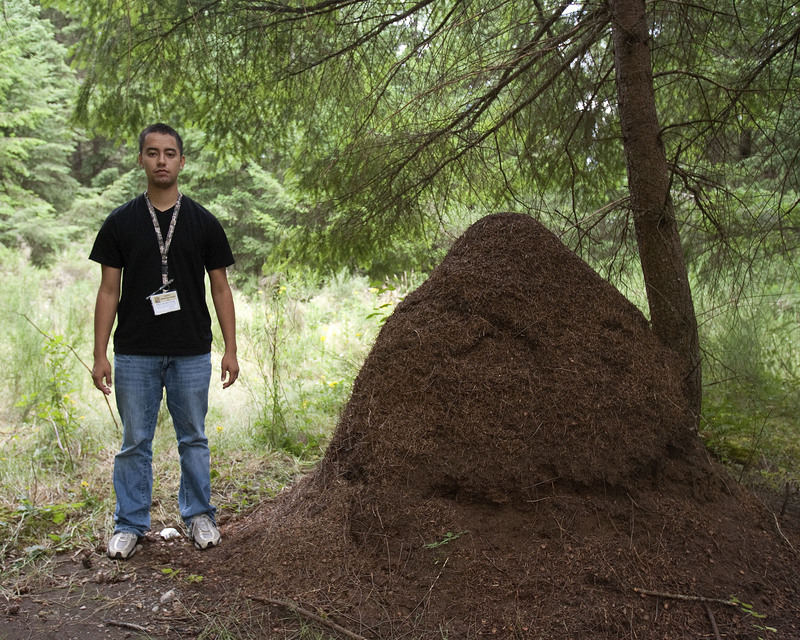 The forest floor of Joint Base Lewis-McChord is alive, alive with ants. Cadets see for themselves the true power of nature as they maneuver around the mini highways of moving sticks and pine needles during their base-wide training. The Squad Situational Training exercises (SSTX) and patrol (PSTX) lanes are where Cadets get an up-close encounter with the six-legged legends of the Leader Development and Assessment Course (LDAC). If Cadets hadn’t been briefed on the enormous ant hills prevalent in the tactics training area, they might have been concerned. All Cadets are briefed before they conduct a mission about the possible environmental hazards, and the ants are one of them, said Maj. John Brauneis, the tactics safety Officer. Any Cadet that has been through LDAC can tell you that the ant hill myth is no myth at all, with some reaching heights up to 5 feet tall. The scavenger ants were introduced to ensure the safety of the forested areas that make up much of the Northwest Washington base, said Steven Lopez, the tactical operations officer for the tactics committee. “They are everywhere, and I mean everywhere,” said Mr. Gutherey, deputy safety chief at the Leader Development and Assessment Course. Brauneis said the Cadets have not had any bad safety situations involving the ants and have effectively stayed away from the ants during their training. “They don’t bother you unless you bother them. But if you look at them funny then a bunch of them will round up like a gang and start following after you,” joked Cadet Kewan Holder from St. Augustine College. “When pulling security, if they wanted me to lay in an area with an ant nest I moved a tree over. There are so many of them, I can’t believe it,” said Cadet Ben Horvath from Kent State University. We get bit by a lot of mosquitoes out here, explained Horvath, but those are nothing compared to an ant bite. The ants are something that Cadets at LDAC will never forget. One previous LDAC graduate, Iuliana Petre, spent five months dealing with the ants at base and still remembers them. Petre, a retired military Officer, also a contributing writer for the Killeen Daily Herald, once blogged her experience with the infamous LDAC ants. Petre once wrote, if military bases had mascots, an ant would surely be the mascot of Joint Base Lewis-McChord. As Cadets come and go, the legend of the LDAC ants continues to thrive.